We have been organising heli-skiing since 1999. When you speak to us you are speaking to people who eat, sleep and breathe skiing and have been involved on the front line of the industry for two decades. We have either guided or skied at every location on this website (as well as many others). We are uniquely placed to give you the inside scoop, to fill you in on the things that aren’t mentioned in the brochure, to make those little behind the scenes things happen that can make your trip extra special. Whether you are a seasoned heli-skier or a first timer we save you time and effort and we guarantee that you will be getting the best prices available. If you find any trip on this website at a lower price, we will better it. We have been there and done the research for you and we take real pride in telling you exactly what you can expect. We have more in-depth, first-hand knowledge of worldwide heli-skiing than any other company out there and we offer expert, unbiased advice and unrivaled personal service. Maybe you are a seasoned pro looking to pioneer first descents in the Himalayas or maybe you are a first time heli-skier looking for a gentle introduction. Perhaps you prefer roughing it in a tent than you do sipping champagne in the jacuzzi. We're all different. 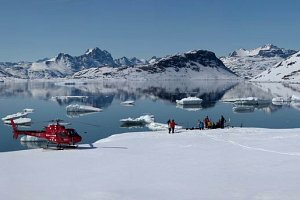 Our carefully chosen portfolio offers you an unbeatable choice of tried and tested heli-ski adventures. What you see here represents only a fraction of the possibilities. Through our partners at K2 Skis we are able to offer all of our clients exceptional deals on K2’s range of skis and equipment. Organisers or larger groups will be given new skis - free. ...an amazing experience and it clearly was the best skiing week of my life. Considering that I started skiing almost 35 years ago, I think it is quite a statement! We like to reward you for your loyalty and to thank you for introducing your friends. When things don’t go quite right we can make a big difference. Blue skies and bottomless powder right? That’s what it says in the brochure and in all the fancy pictures on the website. Well usually, “Yes” but we are playing with Mother Nature here and sometimes she doesn't cooperate. On the rare occasion when things do not quite work out as planned, we will always go the extra mile to make the best of the situation for you. Look at it as an extra level of insurance but without the cost.